OSHAWA, Ontario. 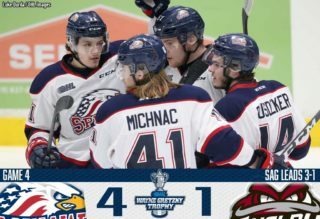 – On Sunday, the Saginaw Spirit and the Oshawa Generals battle at the Tribute Communities Centre. The Spirit won their third consecutive game, downing the top ranked team in the Eastern Conference by a final score of 6-3. Hayden Hodgson recorded a five-point night, scoring a career-high four goals and adding an assists. The Spirit started out strong early in the first period. At 3:03, Kris Bennett scored on a wraparound to the left side of Jeremy Brodeur. Bennett’s seventh goal of the season was assisted by Damien Giroux and Hayden Hodgson. Evan Cormier stood his ground in net, not surrendering a first period goal. The Spirit led the Generals 15-12 in shots on goal at the end of the first period. The second period was littered with persistent goal scoring. Hayden Hodgson scored his seventh power play goal of the season at 4:31 of the period. Hodgson’s deflection of Filip Hronek’s shot was also assisted by Matthew Kreis. Shortly after at 6:37, Filip Hronek scored a goal of his own. The Red Wings prospect who is top 10 in defenseman scoring put the puck past Jeremy Brodeur from the top of the circle. Matthew Kreis picked up his second assist of the game and ninth assist of the season on Hronek’s fifth goal. The Generals attempted to close the gap at 8:29 with a goal from Mitchell Vande Sompel. Kenny Huether and Daniel Robertson drew assists on the play. 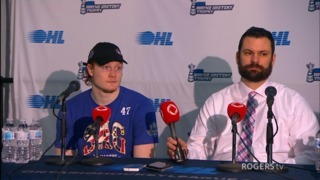 Vande Sompel has scored his sixth goal in the last five games for the Generals. The Spirit gained back their three goal advantage at 9:40 from Hayden Hodgson. The power play goal from the hash marks was unassisted, Hodgson tallied his second goal of the game and 15th goal of the season. At 15:57, the Generals Serron Noel scored his fourth goal of the season with an assist from Medric Mercier. The Spirit outshot the Generals 13-11 in the second period and the Spirit led, 4-2. In the third period, the Generals sought to tie up the game, Medric Mercier scored his sixth power play goal near the blue line. Mercier’s goal at 0:36 of the period was assisted by Domenic Commisso and Mitchel Vande Sompel. After two monumental penalty kills by the Spirit, Hayden Hodgson completed a hat trick from the top of the circles. Damien Giroux and Kris Bennett assisted in Hodgson’s sixth goal in the last three games. A hat trick was not enough for Hodgson. At 19:35 he scored his fourth goal of the game and 17th goal of the season. Cole Coskey assisted on the play. The final shots on goal favored the Spirit 35-31 and wrapped up their perfect week with a 6-3 victory. 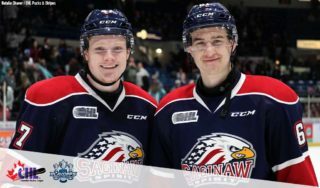 The Saginaw Spirit return to The Dow Event Center on Wednesday, December 14th against the Flint Firebirds. The puck drops at 7:05 p.m., as the Coors Light I-75 Divide Rivals clash for the third time this season. Affordable season ticket packages and flex plans for the 15th anniversary season of Saginaw Spirit hockey are on sale now! 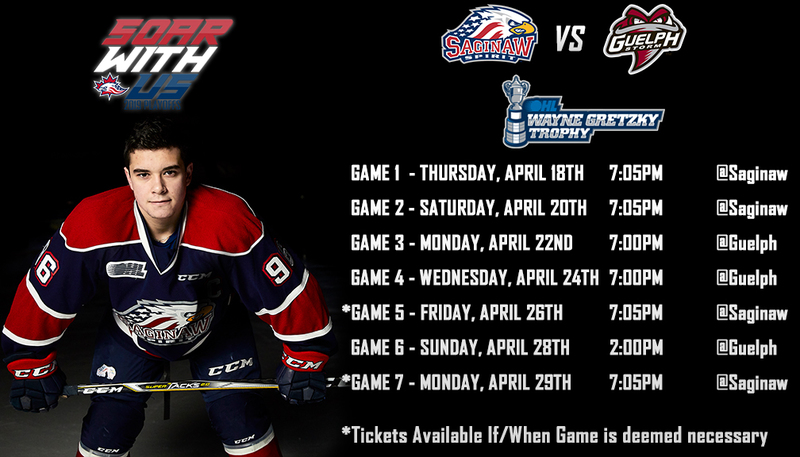 For more information on tickets, visit www.saginawspirit.com or call (989) 497-7747.